This free weekly menu planner will help you to organize a weekly menu which can be used for helping to plan meals in advance for busy moms, help with your weight loss plan for the week ahead etc. 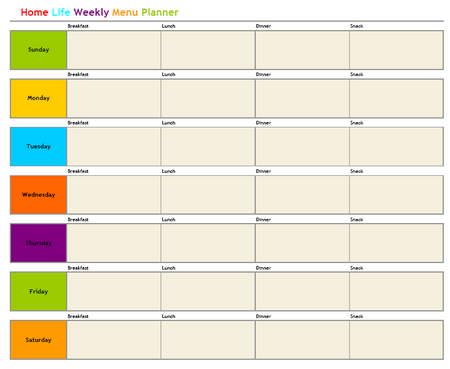 The weekly menu planner it is excellent for helping you to budget for food more clearly and give you focus to help you follow a weight loss diet. All you need to do is to download it and print it. Thanks for participating in this week’s Carnival of Family Life hosted at Vanilla Joy. The Carnival will be live tomorrow, Monday, April 21, 2008, so stop by and check out all of the other wonderful submissions! While planning a week’s meals, it’s important to remember how long your fruits and veggies will stay fresh. It’s frustrating to find spoiled food!